Currently in our fashion history lesson we have been learning about the art nouveau movement and some of the prime people involved in the movement, which ranges from artists to craftsmen. 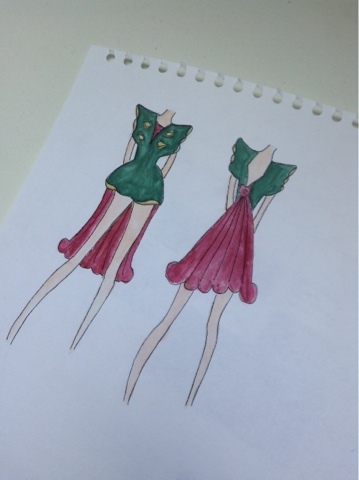 We have been assigned to design a garment inspired by the art nouveau movement, here is my design. I took inspiration from a dragonfly piece of jewellery, I tried to emulate it's shape and colour pattern a little in my illustration, although most of the colours I've used are much more bold in comparison to the piece of jewellery. Sorry for the low quality photos recently and lack of posts, my laptop has broke and I'm in the middle of getting it repaired.